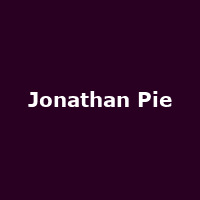 "Jonathan Pie is a respected News reporter for a respected News broadcaster but he has a problem. He has several problems. He hates his job. He hates his colleagues. But mainly he hates the f**king News. Join him for this live show where he hilariously reveals the truth behind recent News events both home and abroad. He'll also be discussing his own meteoric rise to mediocrity...and one imagines he'll be venting plenty of spleen in the process*."